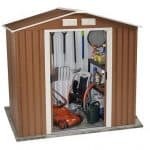 This symmetrical mid sized garden storage shed is made of plastic, so if you’ve been used to timber or metal sheds before you’ll be surprised at the advantages it brings. One of these is that it’s easy to assemble, and once it’s up you won’t need to worry about it again. That’s because it’s free from worries about rust, rot, warping or splitting, and it’s also a fire retardant material so you can even store flammable liquids inside in safety. Once assembled this shed is also strong and stable, and that’s thanks not only to the vinyl cladding itself but to the galvanised steel frame that supports it. It means it can be installed in complete confidence, even in areas that are exposed to strong winds. Both the wall cladding and the roof feature an attractive overlapping style design, and this means that rainwater is quickly carried away so that the contents inside the shed will remain dry whatever the weather outside. Because of this, and the tough nature of the cladding, the manufacturer has been able to give a 10 year warranty. 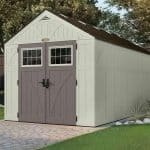 The eight foot by five foot base size creates a lot of storage space, even though the height of the apex roof is lower than we often see on similar sheds. The double doors also make it easy to move large or wide objects inside, so we feel this would make an ideal bicycle shed amongst other things. 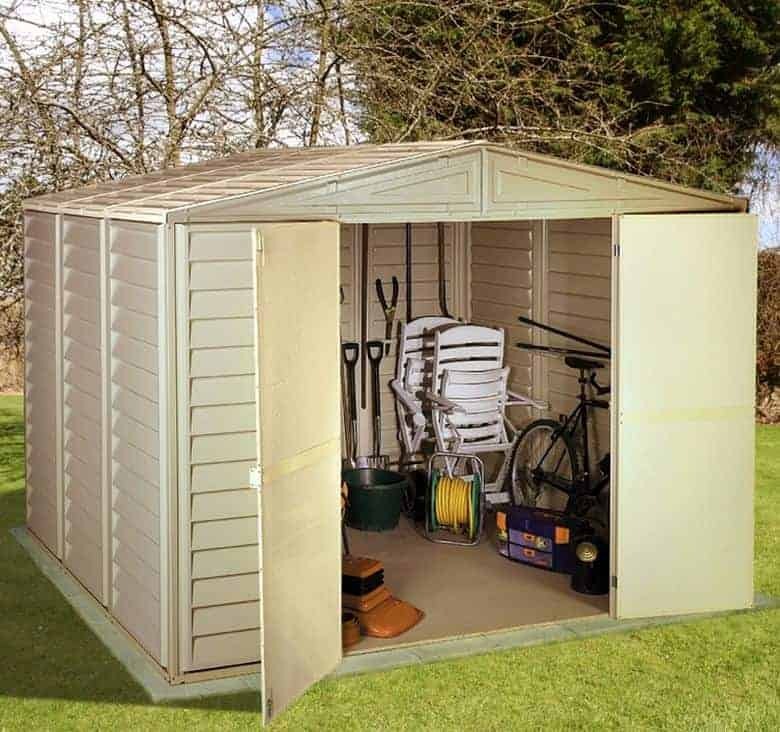 This rectangular shed with an apex roof is ideal for keen gardeners who need a versatile storage space but don’t want to have to spend too much time treating and repairing it. That’s because it’s made of durable PVC, which means that once it’s in place there is no need to worry about it again. We think that it looks stylish too, and it will fit in particularly well on property that already has white or ivory coloured PVC in evidence on fascia boards, or on doors or windows. Despite the use of plastic cladding it follows a traditional design, which means that it’s symmetrical with an apex roof on top. This is good at channeling rainwater away, but it doesn’t add as much height as we’re used to seeing. The ridge height is 1.86m and the eaves height is just 1.60m. The base width is more generous at 2.39m and the base depth is 1.60m. We like the use of PVC cladding not only because it creates a strikingly contemporary look, but also because it has excellent weather resistant qualities and is also fire retardant. Because of this latter quality we can imagine this building being used as an all weather store for motorcycles as well as bicycles. We were pleased to see that the PVC itself is supported upon a tough steel frame, and that means that it feels very stable and rigid once assembly is complete. There’s no floor, which is something that we often find with mid sized plastic sheds, but on this occasion there’s no anchor kit to screw the structure to a level area of concrete supplied either. This is a little disappointing as it’s an essential item rather than an optional extra. We always expect a PVC clad shed to come with a long warranty period attached, simply because of how tough and long lasting the substrate is. That’s certainly what we found here, so that although it was good to see that Duramax have provided a 10 year warranty period we feel that it could have been even longer. One thing that there will be no complaints about is the lack of treatment requirements, indeed the only maintenance that it will need is a hose down from time to time to reduce the risk of algae appearing. 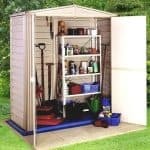 One of the features we found most useful about this shed was the wide opening double doors. Whilst the height of 1.55m, just a little over five foot, means that most people will have to duck down when entering them, the door width of 1.52m is greater than we usually see on the plastic sheds we review. This means that it’s very easy to move wide objects inside, such as the aforementioned bicycles or motorbikes or maybe even a ride on lawnmower. There are no windows on this shed, but because the doors have such a wide opening lots of light reaches into every corner once they’re opened. Whilst the shed has a window free design, we feel that this is in itself a useful security feature. It means that opportune thieves will have no way of knowing if anything of value, or anything at all, is stored inside which makes it less likely in our opinion that it will be targeted by them. One security feature we always like to see, but which is missing on this occasion, is a padlocks. We were pleased to find that the handles were padlock ready however, so an inexpensive purchase can boost the overall security. We mentioned the lack of an anchor kit earlier, and although it isn’t included as standard as we would have liked a set of Hilti screws which can do the job are available as an optional extra. They allow the building to be affixed to a suitably sized level area of concrete, but if no such area exists then it will have to be created before the shed can be installed. Another optional extra, a steel foundation kit, makes this relatively easy although it does add £70 to the price paid for the shed itself. From the way that the parts fit together so well to the tough steel frame, it was clear that this is a high quality shed. PVC cladding is very weather resistant and very durable, as shown by the inclusion of a 10 year manufacturer’s warranty. 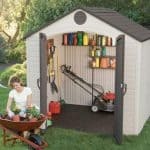 The width of this shed puts it firmly in the mid-size category, although the depth and especially the height could have been a little more accommodating. With its clear instructions this is easy to assemble, and with a friend’s help it can be completed in around four hours. 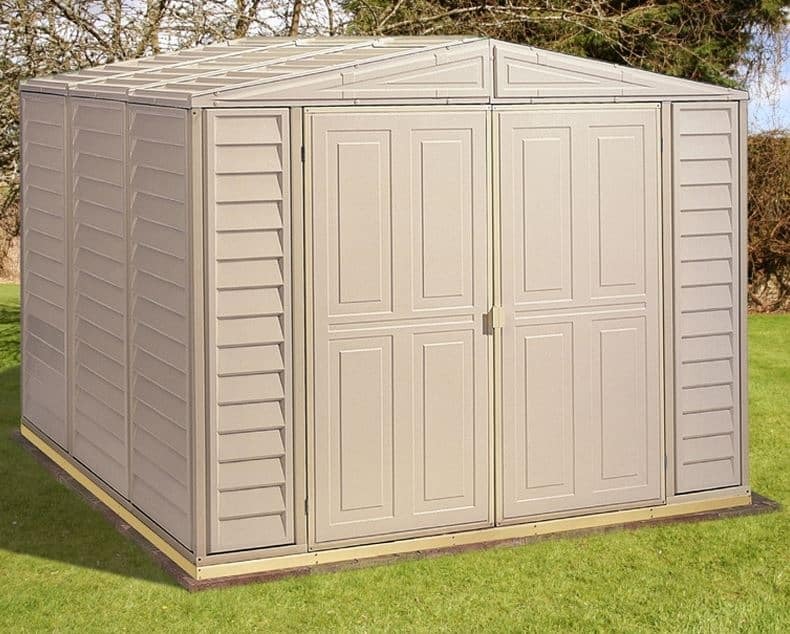 Whilst this is a very durable shed, and one that requires no future treatments, we have reviewed lower priced sheds with a larger storage capacity. Final Thoughts: Lots of people are finding how attractive white PVC can be on and around their property by way of rooflines and conservatories, bit this shed shows how effective and aesthetically pleasing it can be when used for garden buildings as well. We liked the fact that there are no treatment requirements as this can add up to a considerable saving of time and money when compared to timber sheds. 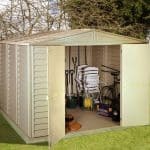 It’s also much easier to assemble than many of the timber sheds we review, although the owner will have to buy an anchor kit or set of Hilti screws separately to fasten it down to a flat area of concrete or paving.